After I finished Flip 7 and got the Airbnb house up & running, I took a little rest. Because, well, I obviously earned it. During that break, I really took the time to analyze what is next. I spoke with my financial planner, analyzed my previous real estate deals, and my goals. After a lot of consideration, I think we all landed on the same page as to what needs to be next for me! And it’s a heck of a next project! If you subscribe to my newsletter, I dropped this little secret last week. *(PS- To sign up for my newsletter, enter your info on the right side of the page!) 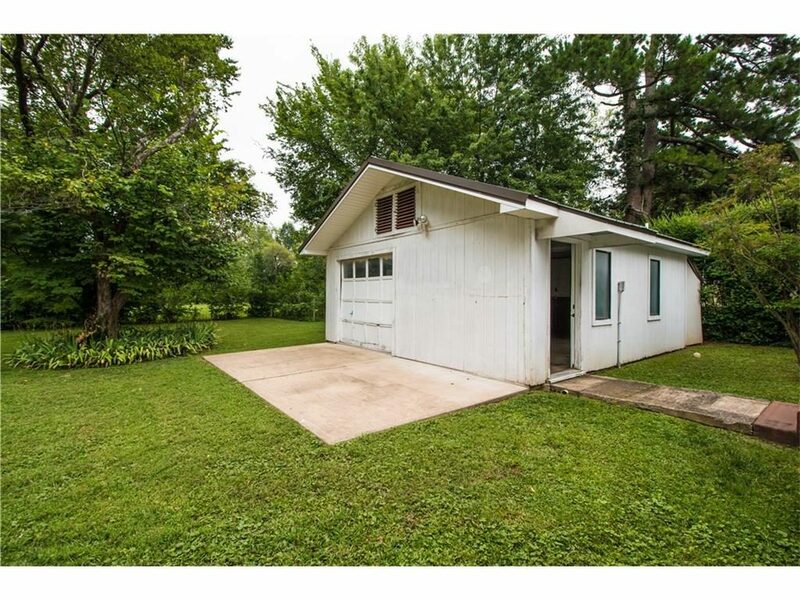 But the next big project around the Bachelorette Pad is to convert the detached garage into a studio Airbnb apartment! Like I said, it’s a heck of a project! I can’t wait to show you my detached garage conversion plans! 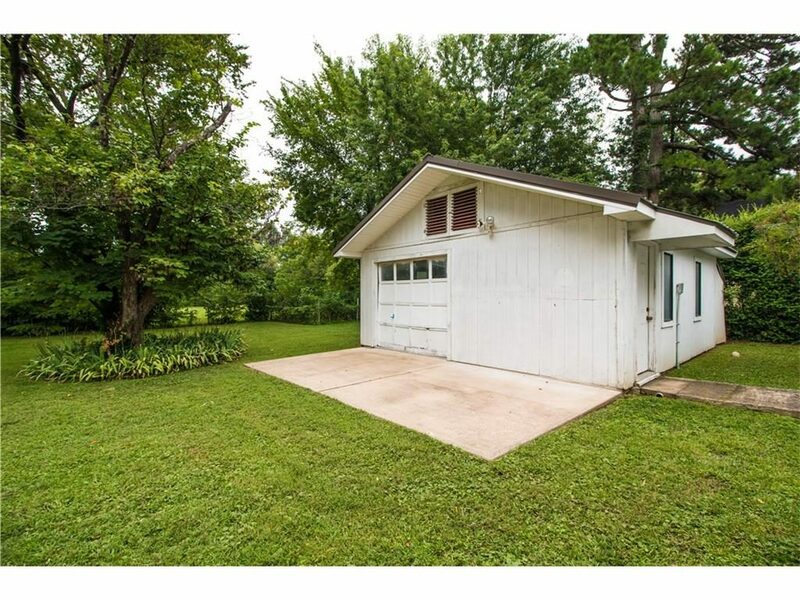 If you’ve followed along since I bought Flip 5 last summer, you may remember the detached garage. It actually used to be a woodworking shop for the previous owner. I’m not going to lie- it’s in rough shape. The garage door is wood, decaying, and completely off its track. The exterior is dirty and lacks any character. In its current setup, the only access door faces the back of the house. There are a couple features that it already has that will save me a lot of money– existing plumbing and a concrete slab. There will be two major changes to the exterior. The non-functioning garage door will be replaced. I initially thought about replacing it with an interior, glass paneled garage door, but I have not found one in my budget that I like. So I’m hoping to add French doors where the garage is located. I want the access to the apartment to be on the front, rather than on the side between the houses. The current door that is located on the side will be removed and siding adding so that, hopefully, you can’t tell there was ever a door there. After the two big changes, I plan to give it a fresh coat of paint, add some shutters, and some window boxes to create a little charm. Depending on the pitch after the French doors are installed, I may have a canopy style roofline added over the doors. Don’t laugh! The bathroom needs a lot of work! When the shop was built by the previous owner, he had plumbing installed for a toilet and sink. It’s a small little closet with virtually no design appeal (check out that paneling!). 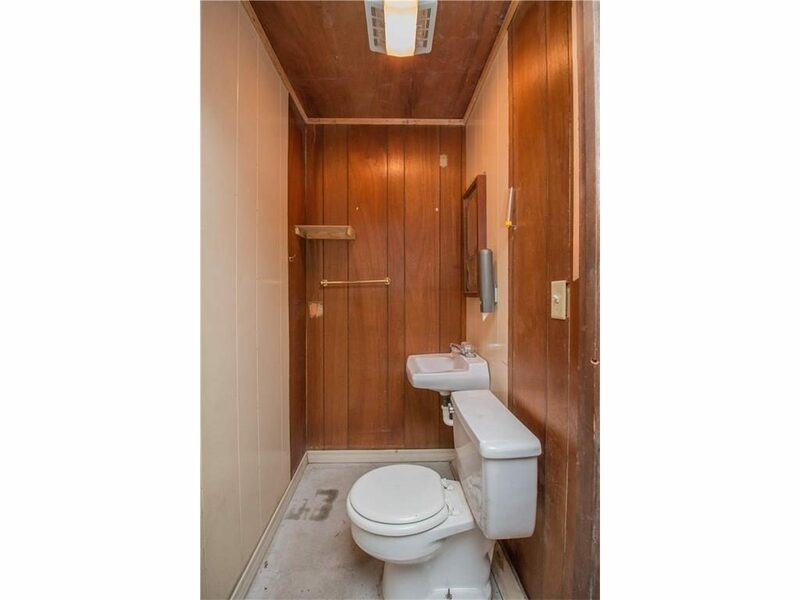 In its current state, the bathroom doesn’t have room for a shower. Since the shop sits on a concrete slab, adding additional plumbing will be costly, so I’m trying to minimize that. The design options are very minimal. I still haven’t finalized the location for the upright shower. Regardless, the task is going to require busting up part of the concrete slab to run new lines and then repour the concrete. Space is quite limited in this garage, so I’m going to have to get creative. Part of that creativity means there will only be a standup shower- no tub. It will be a single faucet and a space-saving toilet. I’ve already consulted with one plumber, and I have a couple more coming to give bids. We understand the space and financial challenge ahead of us with this bathroom- it’s going to be the most difficult part. I have a feeling Plan A, Plan B, and maybe not even Plan C will work in here. This will definitely be a trial and error room! The interior needs A LOT of work– and that’s an understatement. In its current state- it’s certainly not a very livable space. I plan on creating an urban loft feel with some exposed elements. The wood paneling will be removed, and once the plumbing situation is nailed down, then I’ll be dry walling the walls and refinishing the ceiling (once the garage door tracks are gone). Since we haven’t nailed down the bathroom plumbing layout, the kitchen layout is also up in the air. I won’t be adding a full kitchen, but I do plan to add a small kitchenette. I need lines for a kitchen sink. The kitchenette area will either be on the door wall or the back wall opposite the garage door. Once the kitchenette and bathroom are situated, the rest of the space will living space. I’ll have approx 200 square feet to create a living room and a bedroom area- no challenge, right? I’ve been researching loft and open-concept living lately, so I’ll probably be incorporating as many of those elements as possible. The other challenge I’ll have with this space is storage. Again, it will take a lot of creativity to create hidden & visible storage. On the bottom of the to-do list with the garage conversion is to create additional living area outside since the interior space is so limited. 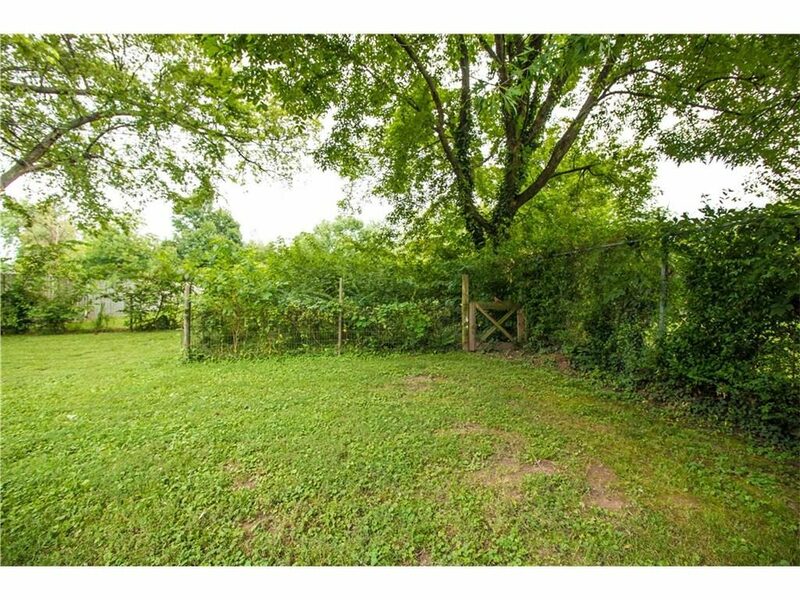 On the property there is an overgrown fenced-in area that was probably a garden back in the day. It’s very, very overgrown with weeds, shrubs, and trees. It will be a monumental task of clearing it. I won’t be clearing this area until the garage is fully complete. 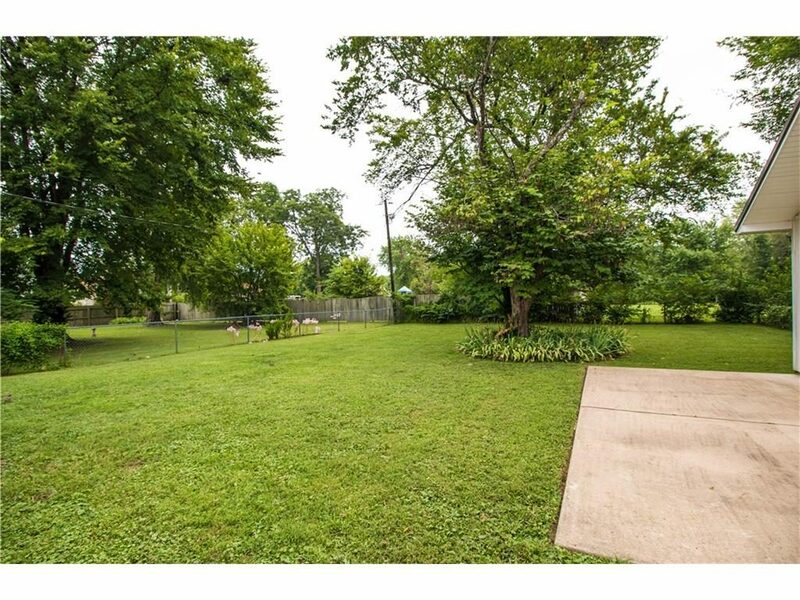 Ideally, I plan to turn this into a conversation/fire-pit area by creating a walkway from the garage. The fire-pit area will be a gravel area with a raised fire-pit and several lounge chairs. Once it’s complete, I think this area will really be an asset to renters. Before my first meeting with Plumber #1, I had budgeted around $10,000 for this project. In the matter of a few weeks, that budget has grown closer to $15,000. And for those of you that are gasping at those numbers, let me give you some numbers to breathe a lot easier. 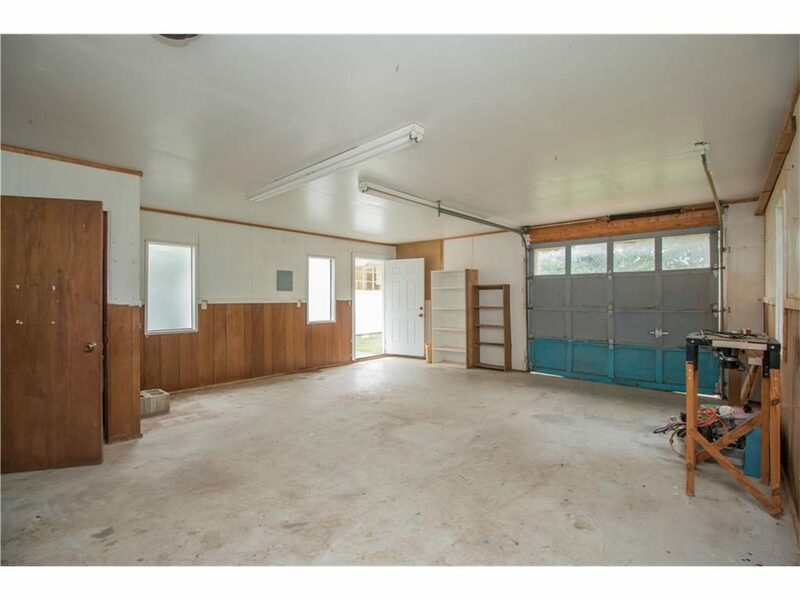 This garage is approx 400ish square feet– none of it heated & cooled. That means I got square footage I didn’t have to pay for and by sinking even $15,000 into this garage, I’ll be able to include the square footage in the resale which will add $40,000 or more to the resell value. So, yes, I’ll spend $15,000 to make $25,000 any day! I had initially planned to start this project before I bought the Airbnb house, but then that deal fell into my lap. So over the last few months, this project fell off my radar screen. But after meeting with my financial advisor and running the numbers, we knew this needed to be my top priority. Once this is completed, this has the potential to pay my entire mortgage for Flip 5 plus some, not to mention the generous resale value it’s adding to the property. I’m not in a massive rush on this project– it’s not a flip I’m trying to get done in 3 weeks. I plan on spending the fall and winter prepping this place. I’ve learned through flipping that my sub-contractors are way more available and sometimes cheaper in the winter, so I hope the fact that I’m tackling a project in the winter will work out well. The very first item to be completed is the plumbing. Like I mentioned earlier, I’m meeting with a couple more to get bids and evaluate plans and costs. The expense for the plumber will be almost 1/3 of the entire budget, so I’m also weighing how I want to pay for that. So the timeline isn’t nailed down yet, but I’m getting close! There are a few other items I’ll be addressing as well. Currently, the driveway is a single car driveway fitting two spaces for the main house at Flip 5. It appears the city is going to require me to widen the driveway to a double fitting four cars. I live downtown so street-side parking is limited, so the driveway is a necessary evil to the budget. As I mentioned earlier, when I bought Flip 5 the garage wasn’t included in the square footage since it wasn’t heated & cooled. I will be adding a ductless unit to make the space livable and add value. I plan to utilize the studio apartment as an Airbnb. After running one for a month now, I’ve learned so many ins-and-outs, and I’m excited that this one will be right out my back door- literally. It’ll make the cleaning, commute, and staging much easier! The maximum capacity for the apartment, when completed, will be three people. I’m hoping the windows pass inspection; however, I’m expecting to have to replace some or all windows due to fire code. Once the garage is completely converted and before the fire-pit project, I’ll be doing some landscaping projects to add some charm to the exterior. I have flipped houses– taken the worst and made them appealing. But a garage? This one will be a new one with its own set of challenges. I’m super excited to get this project going, and, of course, I’m excited about the income potential on this one! « Finding Foreclosed Homes…That Don’t Require Cash! I’m loving this conversion plan, especially closing off that one door and installing French doors on the garage door wall. Wouldn’t take much to build a shed type canopy over them – maybe with a tin roof – just enough to shelter the occupant while leaving and entering during inclement weather. And is there enough roof height to allow a pitched ceiling to create a sleeping loft area? You’re going to love this project – lots of creative challenges and you are more than qualified to tackle any of those! We looked at the pitch to see if we could open up the ceiling but unfortunately it was going to be quite the task & money. I’m excited about this one! It’s outside of my comfort zone! This conversion looks fantastic! You did a great job on it! I haven’t even started! Make sure you read the full post! I’m excited to see how this turns out! I love an Airbnb and it must be really cool to have the option to turn bonus space into a money maker. Your return on investment is going to be great. It’s especially cool that since it is a vacation rental no one is expecting a full kitchen or huge bath. That’s exactly what I was thinking! The ROI on this one is just a no brainer!